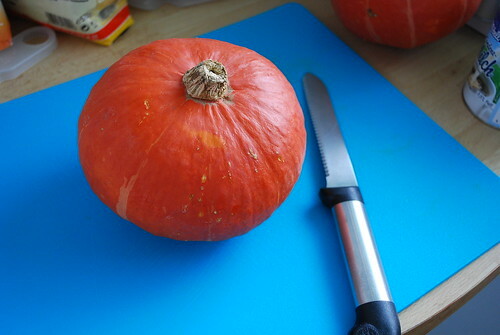 November 5, 2009 Adri H.
Well, let me begin with the fact that I now live in Munich, and sugar pumpkins aren't really on the market. So, the ideal would be a sugar pumpkin or a pie pumpkin, but what we have here isn't really that far off the mark... a Hokkaido pumpkin! Yay! *can also be substituted for Coconut Milk for a lighter taste (not sweetened coconut cream unless you want an extremely sweet pie). Wash pumpkin exterior. 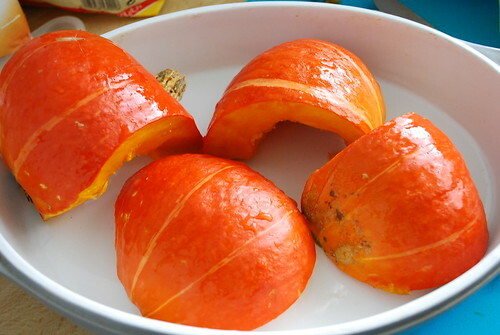 With a serrated blade, quarter the pumpkin and scoop out the seeds. Place the hollowed pieces face down onto baking dish or cookie sheet lightly oiled and aluminum-lined. 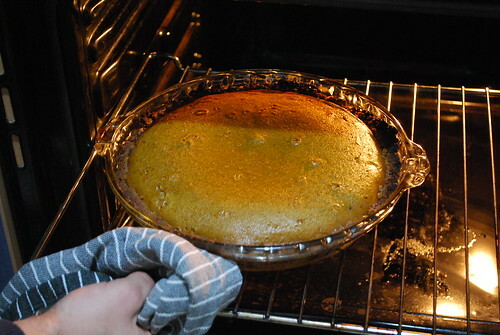 Bake at 170 degrees Celsius for 45 minutes or until tender (fork can easily pierce the fleshy innards, some pumpkins cook faster than others, so check halfway through). 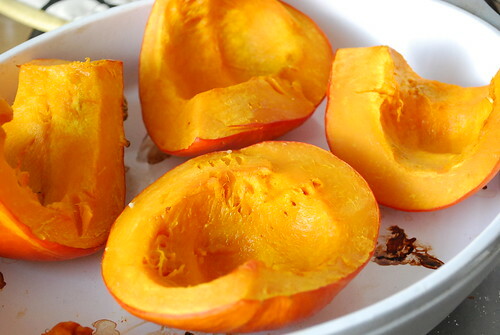 Scoop out pumpkin goodness (avoid scooping skin). 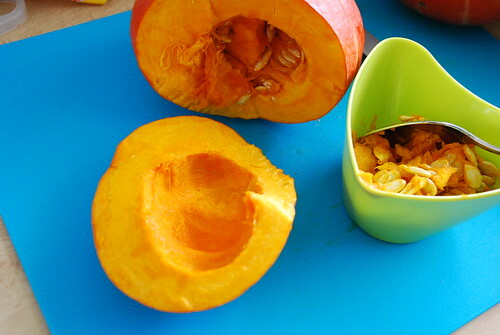 Each Hokkaido pumpkin yields a different amount, but it should be around 2 to 3 cups of pumpkin. Let this cool a bit and then mash it. 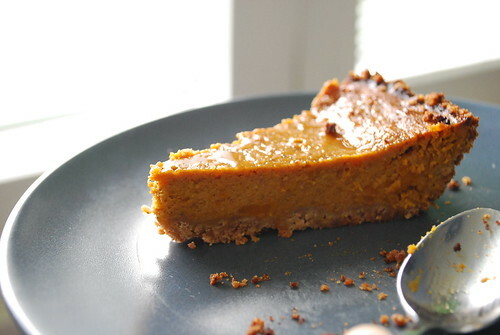 For a more country-style pie, leave the pumpkin mash a bit chunky. Assemble your dry ingredients, and pre-heat your oven to 230 degrees Celsius. In a bowl with your pumpkin mash inside, add in the milk and honey. Then, add the dry ingredients (sugar and spices) and lastly, the eggs. Make sure they are well combined. 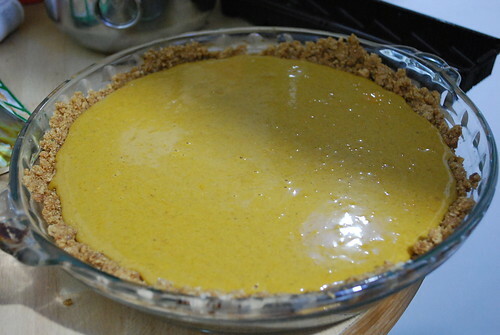 Have your pie plate ready with it's crust already in it... then pour the mixture in. Bake at 230 degrees C for 10 minutes and then lower the temperature to 180 and bake for another 40 to 50 minutes. My oven has a nice air-flow so it actually only takes about 35 minutes. Check to make sure it's ready by sticking a clean knife in it and if it comes out clean, it's most likely ready. Let it cool and set. Update: Here's a photo of a slice made with coconut milk and a graham cracker crust after it set.